The East Rutherford, New Jersey entertainment-retail complex formerly known as Xanadu is in trouble. Again. With 2.3 million-square-feet, a $2 billion plus price tag, and a less than stellar economic climate, we're hardly surprised. But Steve Ross, chairman of the Related Cos.,who became involved in the project earlier this month, isn't deterred. (Who can blame him, with the NFL announcing yesterday that the 2014 Superbowl will take place at Meadowlands Stadoium?) 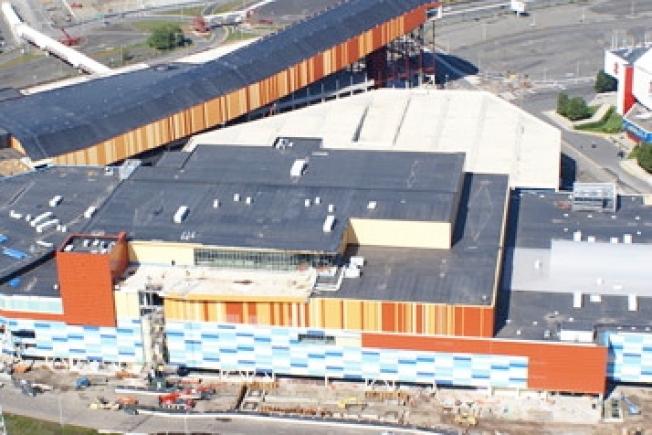 He's changed the megamall's name to the more inocuous (um, boring) Meadowlands and is seeking additional funding, WWD reports. Originally slated to open November 2008, but postponed twice, a debut date doesn't seem to be in sight. And now, tenants are reportedly pulling out. Cabela’s, a sporting goods superstore, planned to create an over-the-top space with a huge mountain replica with waterfalls and streams, a 9,000-gallon aquarium and a museum-quality diorama of African game animals. But the CEO recently said that a store at Meadowlands seemed unlikely at this point. Elle, which was once involved, if only nominally - the Elle Pavillion was to feature a runway and exhibition space - has severed its ties. It is unclear whether clothing companies that signed leases, including Zara, Abercrombie & Fitch, Forever 21, Mango, and H&M, plan to hang in there. Really, though, with all its other attractions - the tallest Ferris Wheel in North America, the U.S.'s first indoor ski resort, a skydiving simulator, a museum (seriously? ), and bowling alleys - isn't shopping besides the point?